Mr Green is playing matchmaker this week and sprinkling a touch of romance over the reels of Flowers and Dazzle Me. These slot games have been picked for a Valentine’s themed prize draw with some very romantic rewards. If you fancy getting all loved up and winning the treats that Mr Green has to offer, keep on reading to find out more about the Love is in the Reels promotion. It’s fair to say that Mr Green must be in a lovey-dovey mood this Valentine’s Day, as every one of the 100 winners in the Love is in the Reels prize draw will be treated to a £30 voucher for Euroflorist. Euroflorist is a Swedish flower delivery company which can send beautiful bouquets right to your loved one’s door. These vouchers will, of course, come in particularly handy at this time of year, but the vouchers will be yours to use whenever you like. The cash prizes dished out to the top three winners are paid out as real money not bonus funds. That means that there are no wagering requirements attached and the cash can be withdrawn immediately. This promotion is active from February 3rd until midnight on February 9th. For your chance to be one of the lucky winners, sign into Mr Green Casino any time between these dates and play 20 rounds on Flowers and 20 rounds on Dazzle Me- don’t worry we’ll tell you a bit more about each of these slots. Once you’ve completed these required rounds of gameplay, you will be entered into the prize draw. For higher chances of being picked during the random draw on February 10th, repeat this step as many times as you like. 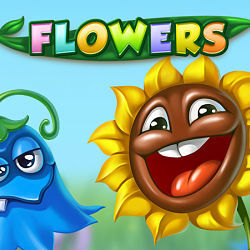 If there’s one slot game that suits the flowery theme of this promotion it has to be Flowers by NetEnt. This game will whisk you away to an English country garden on a sunny spring day with its brightly coloured blooms and blue skies. Flowers has five reels, three rows and 30 pay lines which can be played for between 30p and £75 per spin. In addition to double symbols, scatters and wilds, this slot features a free spins round which dishes out up to 25 spins with a 3X multiplier. Unusually for a NetEnt slot, this five reel game has 76 fixed pay lines but an adjustable amount of rows. The slot also has a bonus round which rewards players with up to 16 free spins and a Linked Reels feature. Dazzle Me can be played for as little as 20p and as much as £400 per spin, making it suitable for all types of players and betting budgets. Love is in the Reels is active from the 3rd until the 9th of February 2017. All registered members, new or existing, of Mr Green Casino are welcome to take part in the promotion during this time. Only real money wagered on Flowers and Dazzle Me counts towards prize draw qualification. All winners will receive their Euroflorist gift cards via email. These vouchers cannot be exchanged for cash or bonus alternatives. The top three prize draw winners will be informed via telephone within 72 hours of the draw taking place. It is essential that Mr Green has your correct contact details on file, as any winners who cannot be contacted will have their reward revoked.